The Chancellor is the chairwoman of weapons company Thales. Our Federal government is engaging in the biggest defence build-up since the Second World War. In the 2016 Defence White Paper, the Australian government outlined an 81 per cent increase in the defence budget over the next decade, translating to an additional $29.9 billion and the hiring of 4400 new Australian Defence Force employees. Recently, Prime Minister Turnbull announced his government will invest $3.8 billion into the arms manufacturing industry, in the hopes that Australia will break into the top ten weapons exporters worldwide. At the same time, Turnbull is slashing $2.2 billion from higher education. Amid cuts to higher education and broader corporatisation, universities have turned to research partnerships to make up the revenue lost from public funding. And with Australia’s newfound embracing of the arms industry, weapons companies are proving attractive bedfellows. For example, Lockheed Martin (the largest arms manufacturer worldwide) established its first Centre for Research outside the US at the University of Melbourne. UK arms manufacturer BAE Systems is set to follow in Lockheed’s footsteps after signing a memorandum of understanding (MOU) with UniMelb in February this year for the construction of a technology hub at Fishermans Bend, Victoria. Similarly, Adelaide University, Flinders University and the University of South Australia form part of the Joint Open Innovation Network (JOIN), funded by BAE Systems, which aims to offer new engineering scholarships, internships, and industry placements for undergraduate students. This $10 million initiative will also see the introduction of defence-focused courses, research and development. University of Sydney Vice-Chancellor and Principal Dr Michael Spence and Thales Australia Country Director and CEO Chris Jenkins sign a 2017 MOU agreement. Closer to home, in late 2017 USyd along with six other New South Wales universities founded a defence research network. With $1.25 million in State government funding, the network aims to increase collaboration across universities and bolster connections between government, industry and academia in the defence sector. As part of the scheme, the seven founding universities will each provide two PhD scholarships for defence-related research projects. The University of Sydney also has links with weapon manufacturers in its own right. Our chancellor, Belinda Hutchinson, is the chairwoman of weapons company Thales Australia. 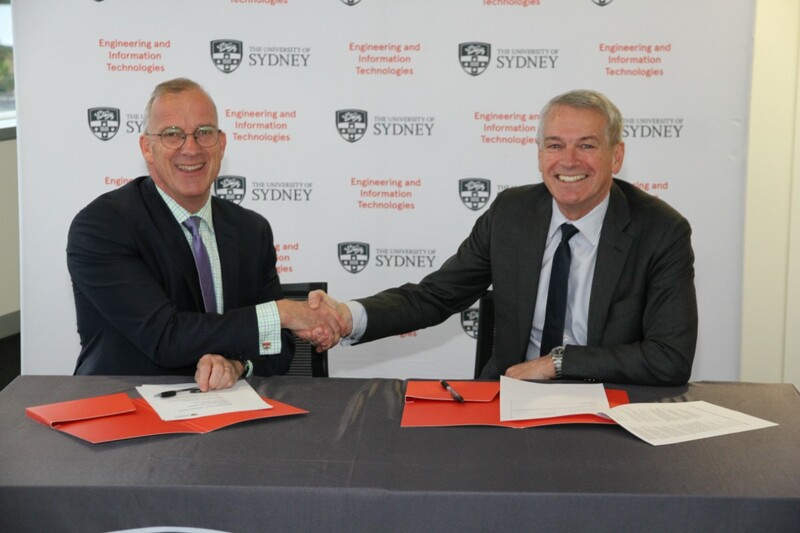 Last year, USyd signed an MOU with Thales so the two can collaborate more closely over the next five years. When I questioned the Deputy Vice-Chancellor (Research) Duncan Ivision about this, he assured me that all conflicts of interest had been resolved. He downplayed the MOU by emphasising that communication lines between the University and the company were simply “open”, whilst refusing to reveal any ongoing projects with Thales. The head of the School of Aerospace, Mechanical and Mechatronic Engineering, Stefan Williams, however, revealed that the School has entered into ongoing programmes with Thales, but that they are “confidential”. The School hosts the Sydney Industry Placement Scholarship (SIPS) as an optional part of their honours programme which effectively doubles as an internship, with $18,000 paid to selected students who then spend six months working for various aerospace, mechanical and mechatronics companies. The School is also in talks with large weapons companies including Lockheed Martin, Boeing, Northrop Grumman and Honeywell who seek to expand the SIPS programme for fourth year engineering students. Aside from research partnerships, the University also has investments in several arms manufacturing companies. Documents obtained under freedom of information laws show that USyd holds short term investment positions in several arms manufacturers worldwide. A number of these are ASX top 100 companies, including Boeing, Lockheed Martin, General Dynamics, Raytheon, Northrop Grumman, General Electric, Rockwell Collins, Hewlett Packard Enterprise Company. At the end of 2017, the total amount invested was $15,173.20. More sinister is the list of the university’s long term investment positions when cross referenced with the top 100 arms manufacturers worldwide. Companies included are CSRA, DynCorp International, Fluor Corp, Engility, Rolls-Royce, ThyssenKrupp, United Technologies Corp and Honeywell International amounting to a total of $4,035,416.72 as at the end of 2017. Of that figure, $3,353,084.84 was invested in Honeywell. Interestingly, Honeywell has repeatedly surfaced in the the USyd Engineering Faculty’s promotional material. USyd also sponsors a Honeywell summer school programme for senior high school students. This programme is an opportunity for students to learn the fundamentals of engineering and includes site visits and talks from private corporations. Honeywell is the company that developed cluster bombs during the Vietnam War which have killed over 20,000 people since. They are also part of the consortium that operates the Pantex plant, where all the United States’ nuclear bombs are assembled. Honeywell provides the engine for the MQ-9 drone, the world’s deadliest UAV, which is responsible for civilian deaths in Pakistan, Afghanistan, Yemen and Somalia. New Zealand Super Fund recently divested from Honeywell, citing ethical concerns. A group of high school students attend a Honeywell Summer School camp in 2014, supported by the University of NSW; University of Technology, Sydney; University of Sydney; University of Western Sydney; Macquarie University; and the University of Wollongong. The University also opts into Vanguard’s International Shares Select Exclusions Index Fund, which holds investments in over 1500 different companies. While promoting itself as an ‘ethical’ fund, it maintains significant investments in Raytheon ($452,535.49), Rolls Royce ($133,333.90), ThyssenKrupp ($102,069.92) and Thales ($100,896.14), as at the 18th of March this year. It is unsurprising that universities are strengthening their links with arms companies: our Chancellor sits on the board of a weapons manufacturer and our Vice-Chancellor’s salary is $1.44 million. Universities are operating under a neoliberal framework which ultimately comes from the highest echelons of government. With the Turnbull government motivated by this agenda, and the Labor party offering ineffective opposition, this is unlikely to change in the near term. There is also disturbing bipartisan support for Australia’s ‘defence’ and ‘security’, whether through maintaining the US-Australia alliance or our torturous refugee policy that sees innocent people languishing in offshore island gulags in the name of border security. Students, the most important stakeholder in the education debate, should demand that they be anti-war institutions. In fact, as universities are increasingly active in broader society than they have ever been, we need to demand that USyd not fund death and destruction via research and investments. It’s time to revive the anti-war sentiment of the 60s on our campuses. The University must divest from corporations like Honeywell, and instead fund research which improves lives, rather than destroys them. So while universities might be strengthening their ties, it is we students who hold the collective power to sever them and disarm USyd.